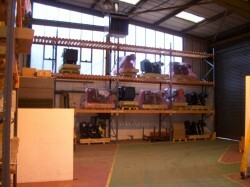 Selwood, based in Southampton, are recognised as one of the leading plant and pump rental companies. Selwood not only provide and maintain pumps for installation throughout the UK but also manufacture their own range of pumps in Chandlers Ford. Hampshire Mezzanine Floors have been supplying storage equipment to Selwood for over 20 years mainly providing Dexion pallet racking. 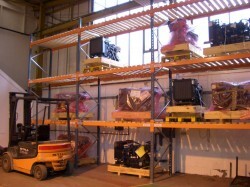 HMF were asked to design a storage system capable of holding heavy unit loads of different size pallets. 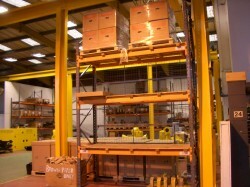 HMF specified Dexion Speedlock pallet racking with open boarded structural decking. This decking spanning front to back between the pallet racking beams is capable of holding 2 tonnes per level and therefore enabled Selwood to be able to place different size unit loads within the racks. 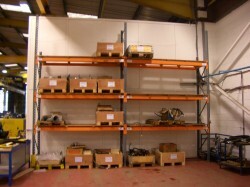 HMF also, provided other safety features such as column guards fitted to the exposed uprights of the pallet racking that could take sacrificial impact damage from fork trucks manoeuvring without physical damage being inflicted on the pallet racking uprights. HMF also fitted load notices, clearly advising the maximum load per pair of beams and maximum bay loads so that Selwood’s personnel were aware of the load limitations.